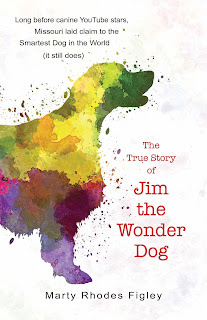 THE FIRST ROAD TRIP WITH OUR "WONDER DOG"
Several years ago I wrote about a fabulous dog in my book THE TRUE STORY OF JIM THE WONDER DOG. Words on the dust jacket proclaim that Jim could understand foreign languages, Morse code, recognize colors, numbers and predict the future. It's never been proven that he couldn't. We do love our dogs. And they are all wondrous in their own ways. My husband and I certainly unabashedly adore our 16-month-old Samoyed, Emily. Although she doesn't do the things that Jim supposedly did, she is a pretty smart girl . . . and she is very photogenic. 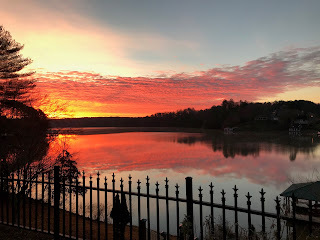 This week we traveled to North Carolina to visit our daughter's in-laws. We like these people and would be friends with them even if we weren't "related" by marriage. But, they do not own a dog and we were concerned that Emily might be too furry, too rambunctious, too doggy for them. Emily—before seven hour trip commences. She knows something's up. 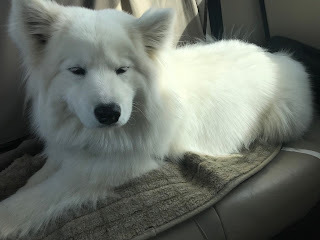 Before now her trips have been to the vet, the pet store, doggie daycare, and short jaunts to visit local friends and family. We secured Emily with a strap that fastened into the seat belt holder. It is attached to her safety harness. In our small Honda that's the most practical solution for travel. It's never a good idea to travel with a dog in the front seat. Emily was not sure about the accusing voice on our car navigation system when we made an unexpected turn off the route. 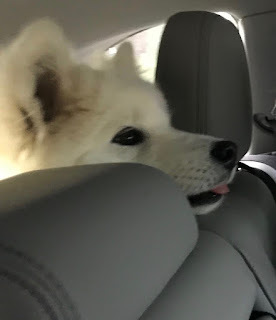 But our Samoyed settled down for the ride rather quickly. Our pet was a travel ambassador at the rest stops, greeting everyone. Water was procured from their handy fountains. We packed quite a lot for the trip, including Emily's crate, dog food, dishes, a few toys, a long leash. She is microchipped but we made sure she was also wearing identification. Upon arrival, Emily checked out the excellent lakeside view and vegetation in our hosts' house. 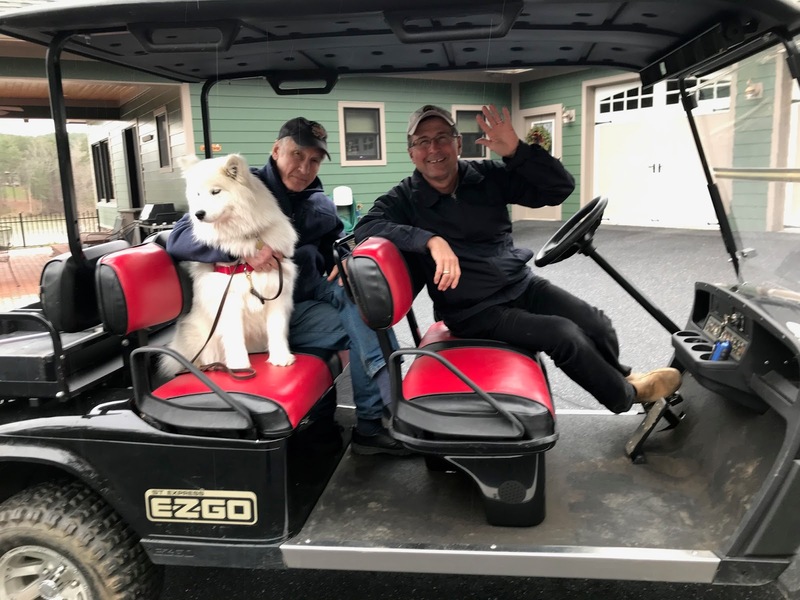 Emily learned the lay of the land on a golf cart tour. . . and in the back of our hosts' van. She helped with dish "washing" after meals. I knew Emily had arrived when my fellow mother-in-law encouraged this! 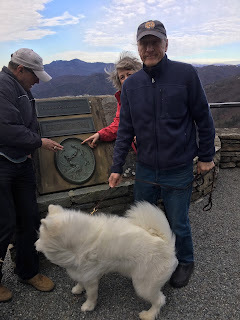 and was wind-whipped with everyone at Blowing Rock. 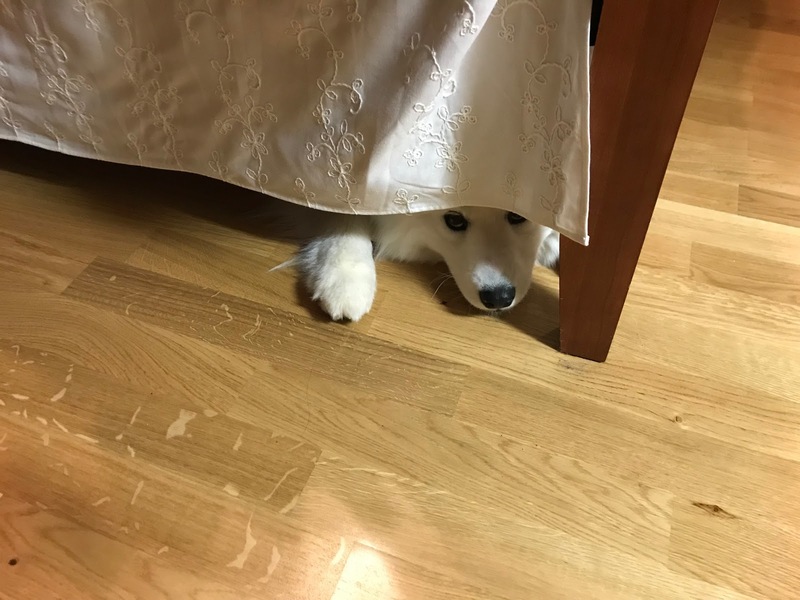 She slept peacefully in her crate at night, although she did check under the bed. At the end of our visit, our hosts said please come again . . . and bring Emily! 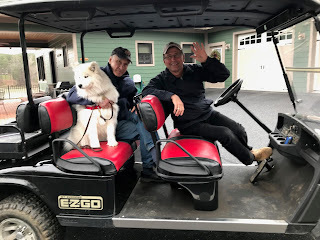 They said our Wonder Dog was an excellent guest! I think Emily's travel future looks rosy indeed! 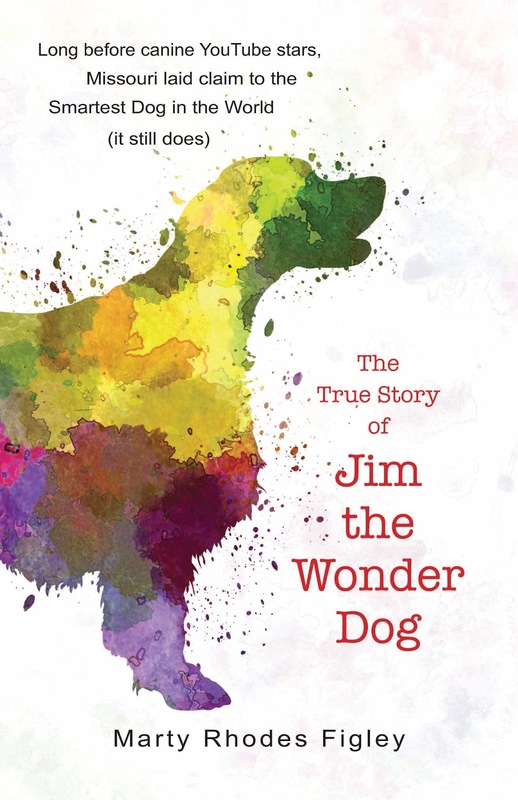 My mind is on dogs because of my newest book THE TRUE STORY OF JIM THE WONDER DOG. It’s about an amazing—perhaps clairvoyant—Missouri Depression Era hunting dog. Yes it is! 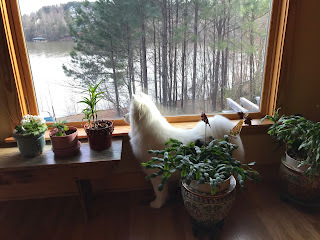 In this blog I want to celebrate the four dogs that have graced our family’s lives. But, I don’t want to be too hagiographic. I’ll also celebrate their foibles. Zelda (named after Zelda Fitzgerald) was our first dog. She was a gorgeous Samoyed. 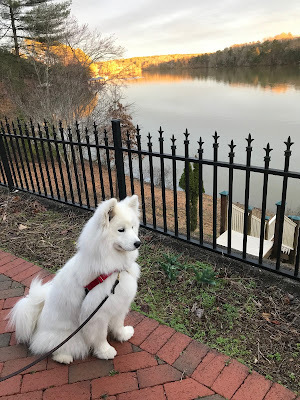 Samoyeds are also called the smiling breed, and Zelda seemed to smile all the time. We bought her when my husband was still in law school. She was my buddy and went everywhere that I did—she loved Big Macs and jogging. We bred her and she delivered puppies on New Year’s Eve. Zelda was with us until my first child turned one. She died in an accident and left a hole in our hearts. Foible: Zelda loved Bic ballpoint pens. She ate them, but never seemed to suffer any ill effects. I found their corpses in the yard and throughout the house. I guess that was the pen my husband used for his studies, but somehow she always got them. Uncas (named after Fennimore Cooper’s Last of the Mohicans) was Zelda’s grandchild. Our neighbor had bought one of Zelda’s pups and bred her. 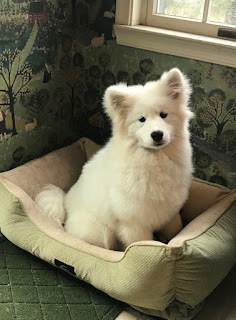 We were able to add another wonderful Samoyed to our family in less than a year after we lost our beloved first dog. Uncas was my daughter’s favorite. 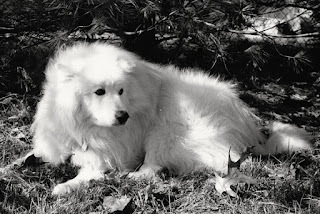 A calm, wonderful pooch, he was probably the most beautiful dog we ever owned. Foible: We never had Uncas neutered. That handsome devil made many escapes over the fence or through the front door during his life looking for love. Only problem was that he could never find his way back. 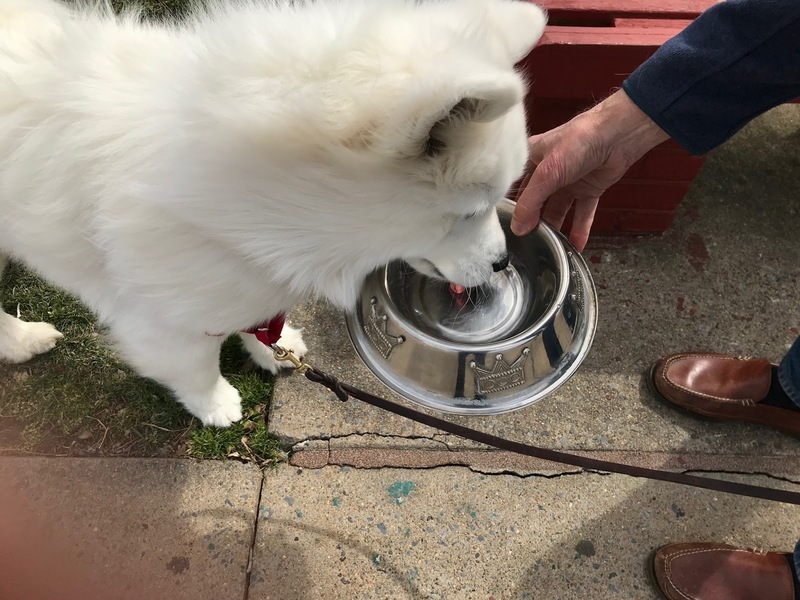 He was so good looking that he attracted attention and kind people always called (our number was etched on his tag) when they found him. We were lucky. Duncan (we just liked the name) was a dignified Scottish terrier with a killer sense of humor. 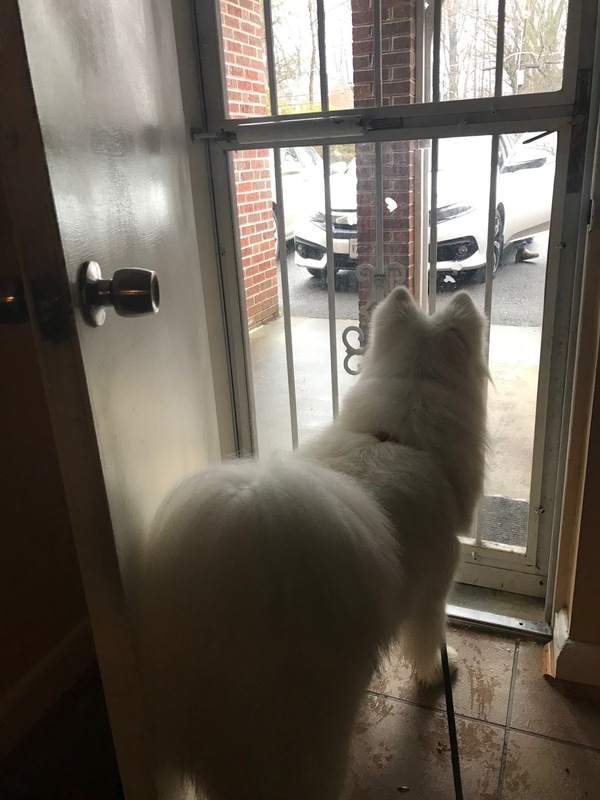 After Uncas died of old age our Samoyed dynasty ended. We decided to try a terrier. 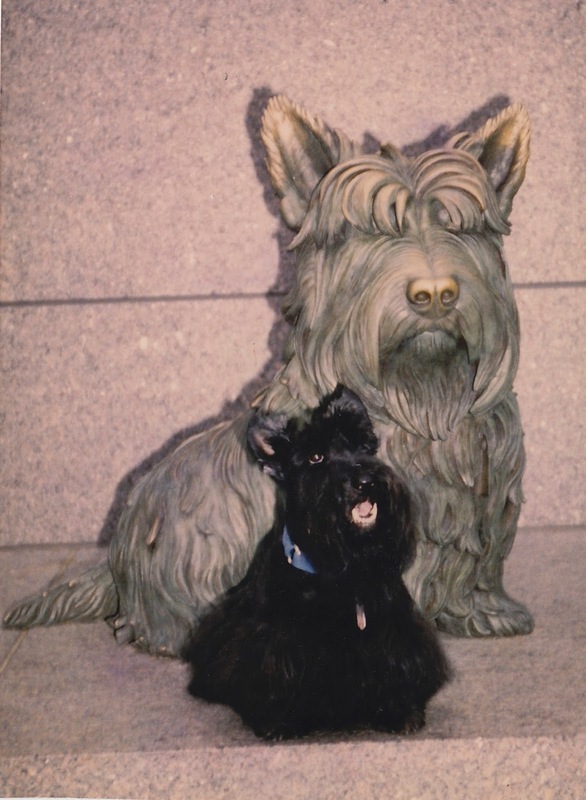 Duncan was short and black and loving. 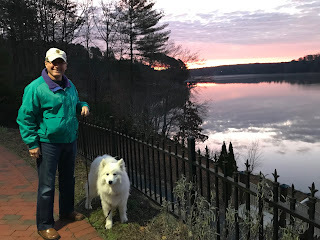 But, like all terriers, always seemed to be snickering to himself—muttering, “You really think I’m going to do what you say?” He was my son’s favorite dog and would constantly nag that teenage boy to come out and play. Duncan could dribble a soccer ball across the yard at lightening speed. Foible: When we brought little puppy Duncan home he immediately went over to an electric light cord, bit it, and got shocked. It was on a Sunday. I went to church and reported to another member of the congregation. She said our dog would probably lose his teeth because of that. That upset me and I felt new dog owner guilt—why hadn’t I kept my new little puppy safe from harm? Of course, she was wrong. Duncan sported beautiful, rather intimidating big terrier teeth his whole life. Scarlett (named after Scarlett O’Hara in Gone With the Wind). After Duncan went to dog heaven we decided we loved the sassiness of terriers and acquired Scarlett. 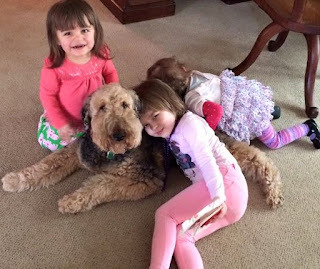 She was incredibly gentle and loving with every one of our five grandchildren. Scarlett was the official dog for three families. I think as dog owners we evolved and made fewer mistakes with her. She lived 12 and ½ full and happy years years and we treasure our memories of her. Foible: We found out that Scarlett loved pumpkin—especially in a pie. Our wonderful neighbor who bakes the best pumpkin pie gave us one for Thanksgiving. All our dinner guests enjoyed the main course while Scarlett slept on her rug beside my husband’s chair. (Perhaps he bragged too much about her controlled, reliable behavior during meals.) The desserts were on the kitchen table. When it was time to cut the pie I discovered the crust had been licked clean and Scarlett had a suspiciously gooey moustache. 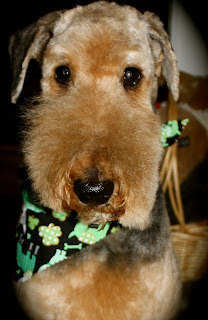 Lesson learned, now pumpkin pies are kept high and safe from the long paws of any Airedale. 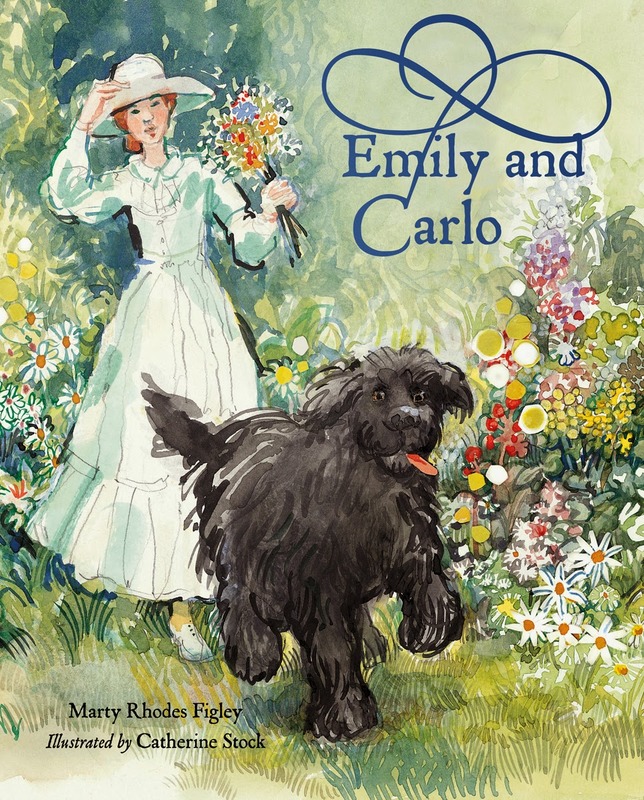 Emily is named after the poet, Emily Dickinson. 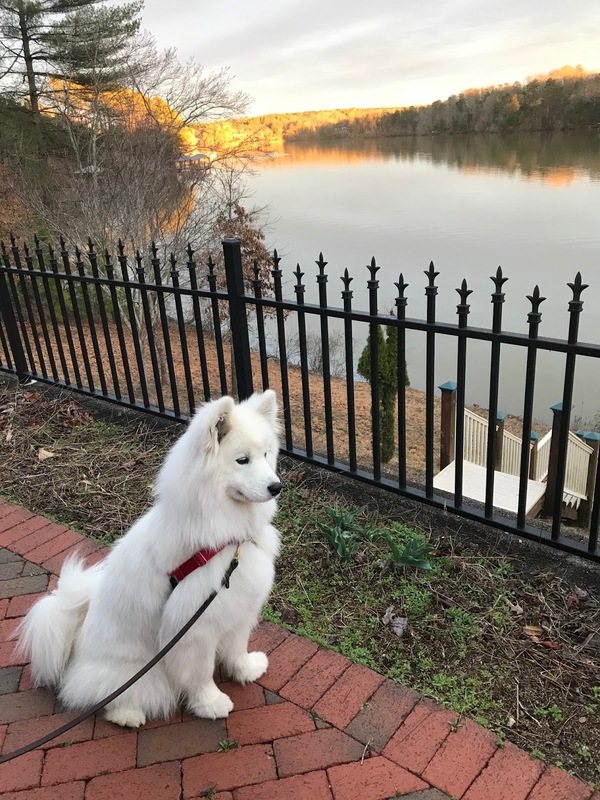 We decided to revisit the lovely Samoyed breed that we started off with. Makes us feel young again. She is gorgeous, smart, full of love and enthusiasm and wants to please us. We are both totally smitten with this delightful 5 month old fur ball. Foible: She is just too cute with that soft fur . . . and those dog kisses. There's a great danger during her puppyhood that we might spoil her, but we will do our best to remain alpha with our newest canine family member. Dogs to me are a blessing. They have enriched my life. Mark Twain also said, “The dog is a gentleman; I hope to go to his heaven, not man's.” Well, I might not go that far, but if there is a heaven and I make it there, I hope my dogs are included. 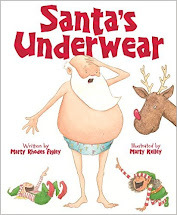 Christmas is on my mind since my newest picture book SANTA'S UNDERWEAR (wonderfully illustrated by Marty Kelley) will make its grand appearance August 1. So I'd like to share the story of my very favorite Christmas gift of all time. On Christmas morning, when I was eight, I ran up the stairs to our attic family room expecting a new doll. Then I saw my present. That sure didn't look like a doll! Was it real? Could it be? I was seriously horse crazy as a kid. I ate oatmeal for breakfast every morning—because horses ate oats. I really wanted a horse. But it wasn't going to happen because we lived in a small house with a small yard in the middle of Springfield, Missouri. Me on my Grandpa Rhodes' farm horse, Nellie. She didn't go very fast, but I was over the moon! What was this? 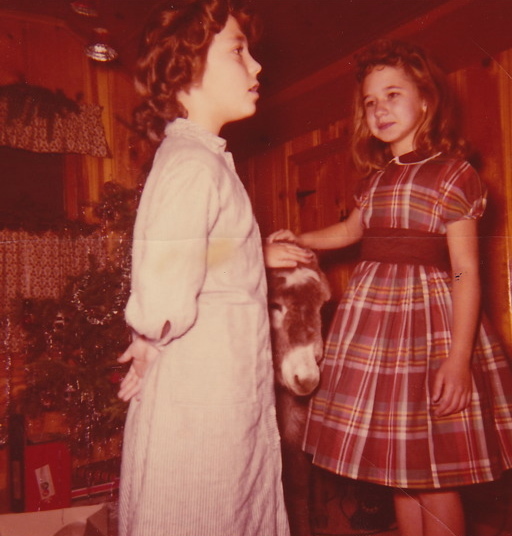 Right here, beside our Christmas tree, stood a real live burro! Not just any burro, but the most adorable burro in the world. He looked like a big stuffed toy. I rushed over and stroked his soft, velvety muzzle. He turned his head to look at me with his big brown eyes. He had the longest lashes I had ever seen. I decided to name him Pedro. 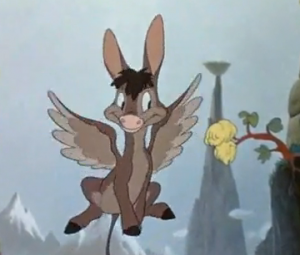 I called my neighbor, Donita, and blurted, "I got a burro for Christmas! Come see!" She was pounding on our front door two minutes after I hung up the phone. Me, in my nightshirt, admiring Pedro with my friend, Donita. I'm not sure where Dad bought the burro, but the important fact is that he did. 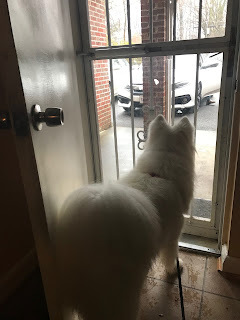 I later learned that around midnight, on Christmas Eve, the family car slowly pulled up in front of our house with my furry present. They must have been quite a sight. Imagine if a policeman had stopped Dad when he was driving and had written a ticket. "Traffic violation: Man driving across town with burro on lap." Earlier, Dad had hidden some hay in our garage. That's where Pedro spent the night before Christmas. He didn't make a sound. The surprise was perfect. All the kids in the neighborhood were impressed and a little jealous. I was an instant celebrity—The Girl with the Burro! Pedro stayed with us through the Christmas vacation. I felt like a real cowgirl as I kept his stall supplied with sweet smelling hay. I ran my hands over my burro's shaggy, rough coat, loving the feel of it. I adored his funny, long ears. Who needed a horse when I had a sweet, darling friend like Pedro? At the end of Christmas break Pedro went to stay at a horse farm at the edge of town. Plans were that I would visit him on weekends. I never did get to visit my burro. Pedro was there for a week and liked his new home. He followed the horses around the pasture. One afternoon there was a winter thunderstorm. A frightened horse accidentally kicked Pedro in the head. He died instantly. My parents didn't tell me what really happened for many years. They didn't want to spoil my love of horses. They said Pedro ran away. I like to think that all our pets end up in heaven. Maybe Pedro is there—waiting for me. MOIRA ROSE DONOHUE REVEALS WHAT'S ON HER FRIDGE! Moira Rose Donohue and I first met for coffee after an essay I wrote about the Scottish actor, Gerard Butler, appeared in the Washington Post. We are both admirers of "Gerry." A few months later (not because of Gerry) I ended up joining a wonderful critique group that included Moira. She is a talented writer and one of those fabulous people whose personality just sparkles. Today, we'll learn a little more about her, and then Moira will answer the burning question, "What's on your fridge?" 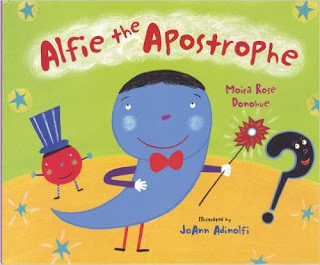 Moira continues, "But then I sort of fell into writing nonfiction when I was approached by an editor. I didn't think I'd like it. 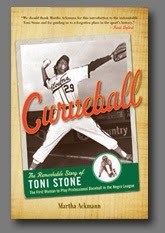 After all, when I was young, I rarely read nonfiction—and only if it related to dogs or ballet! But now I find that I can't get enough of writing it! I love learning about people and animals and history. And I love that feeling of getting completely lost and immersed in another time, another world, another life. Of course, I still write some fiction because otherwise all those crazy stories, like dancing punctuation marks and crime-solving dogs, would take over my brain." Drum roll: May I present Moira's fridge and what's on it! 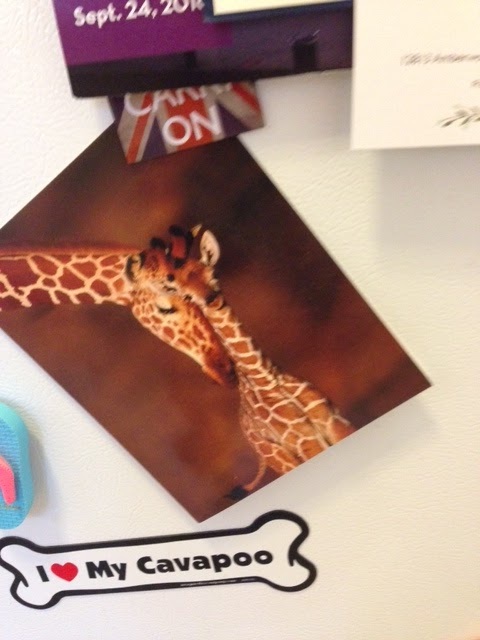 Moira, tell us about what's on your fridge. "What's on your fridge?" is a question that really makes you take stock of what you are doing with your life. 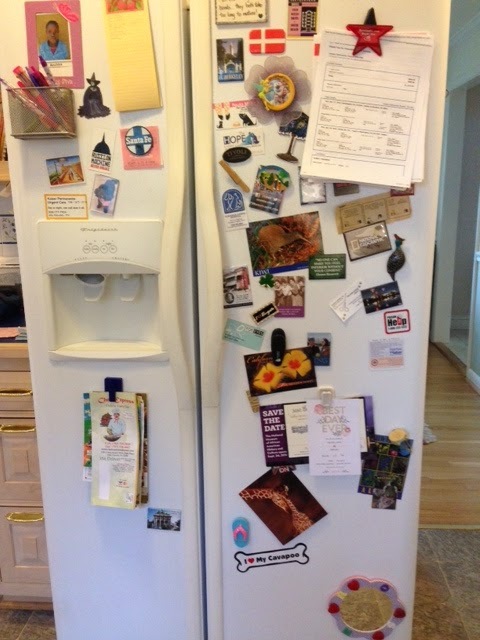 When I stepped back and looked at mine, I was astonished at how much on my fridge was related to travel—either magnet souvenirs of interesting places I have been (Singapore, Tivoli Gardens and Australia); cards from places friends and family have been; and tickets to places I am going. I guess travel is a big part of my life. And it often intersects with my writing life as well. For instance, I went to Denver to see (and kiss) an amazing pig I wrote about in PARROT GENIUS. And I hope to get to the Krefelt Zoo in Germany someday to see Kidogo, the tightrope-walking gorilla I just wrote a story about." Moira, what is your favorite thing on the fridge, and why? "Wow, if I am completely honest, it is a card with a photo of a mother and baby giraffe on it. It's a thank you note from my daughter after my husband and I visited her when she was in Kenya. Not only does it remind me of that wonderful trip and of kissing giraffes while I was there, but she expresses her appreciation for the fact that we gave her the chance to explore the world and to become who she is supposed to be. I feel good that she saw that we were trying to do that. And I guess I hope, in a tiny way, that books I write for children will help them see things in the world in their own unique way." For over a decade, Leslie Pietrzyk and I have enjoyed getting together several times a year at a local strip mall restaurant that is halfway between our two houses. These “literary lunches” always include lots of French fries, white wine, and great conversation. Leslie has a stunning new prize-winning book coming out, and I’m honored to welcome my talented friend as my guest blogger today. 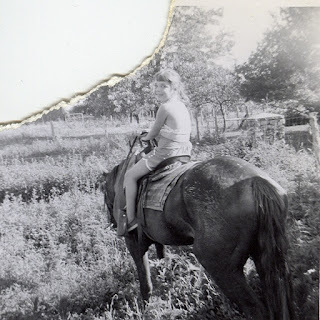 My first husband died many years ago, when he was 37 and I was 35. There’s really no need to state that this was a tremendous loss. In the midst of this turmoil, I didn’t realize that the death of a loved one brings along with it an additional thousand tiny losses, some of which are not immediately apparent. In my case, because I love to cook, and Robb (and I) loved to eat, it turned out there were recipes I could no longer make because eating and preparing those particular dishes made me sad. My new book, This Angel on My Chest, is a collection of linked short stories about Robb and my experience of losing him, and originally, I thought I could never write about him, that it would be way too painful. And it was painful—I can’t deny that. The book blurs fact and fiction, so I was delving into some very real moments from our long-ago life together. But the writing process also rejuvenated me, reminding me that any love we find in life is all the more precious for bravely existing in the face of potential loss. A lot of food seemed to end up in my book—including a recipe I had sworn to keep secret—so I decided I was ready to dig through my recipe file for some of those dishes I used to cook that make me think of him. This recipe is adapted from Gourmet magazine, which was one of my favorite magazines until it ceased publication. Melt butter in a 1-2 quart heavy saucepan over moderately low heat. Add flour and cook, whisking, for 3 minutes to make a roux. Whisk in the beer and the tomatoes and boil the mixture, whisking, for 3 minutes. Reduce the heat to moderately low, stir in the Cheddar, the mustard, the Worcestershire sauce, and the Tabasco, and cook the mixture, stirring, until it is hot (but do not let it boil). Arrange 3 of the toasts or 2 of the muffin halves on each of 6 plates and spoon the Cheddar mixture on top. Garnish the Welsh rabbit with the parsley and serve with the bacon. Serves 6. Marty says, "I made this (see photo), slathered the cheesy goodness generously on two toasted English muffin halves, and wolfed it down with a cold beer. Fabulous!" More information about This Angel on My Chest. Leslie Pietrzyk is the author of two novels, Pears on a Willow Tree and A Year and a Day. This Angel on My Chest, her collection of linked short stories, won the 2015 Drue Heinz Literature Prize and will be published by the University of Pittsburgh Press in October. 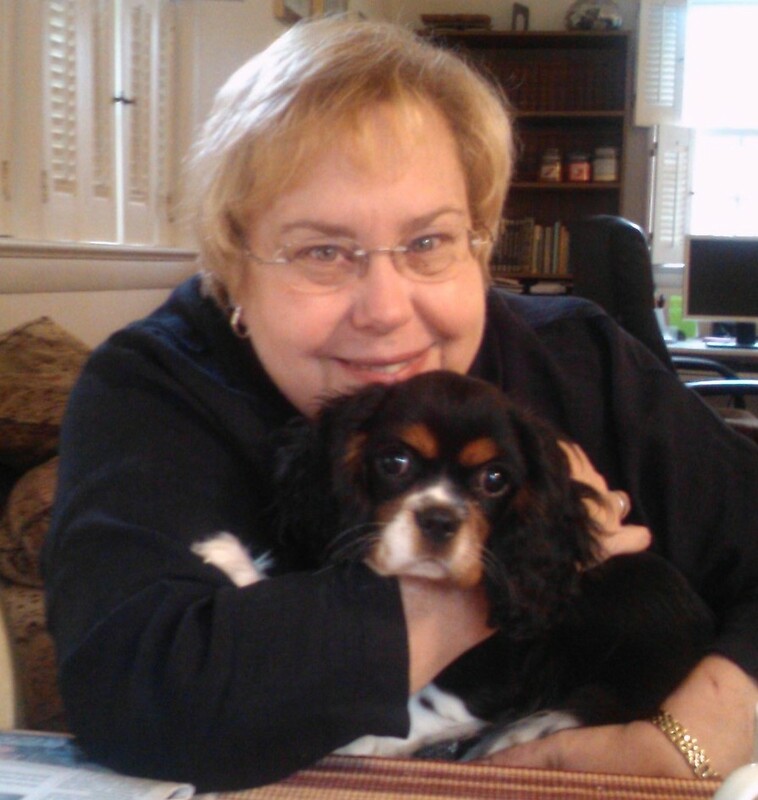 Her short fiction and essays have appeared in many publications, including Gettysburg Review, The Sun, Shenandoah, River Styx, Iowa Review, TriQuarterly, New England Review, Salon, and the Washington Post Magazine. 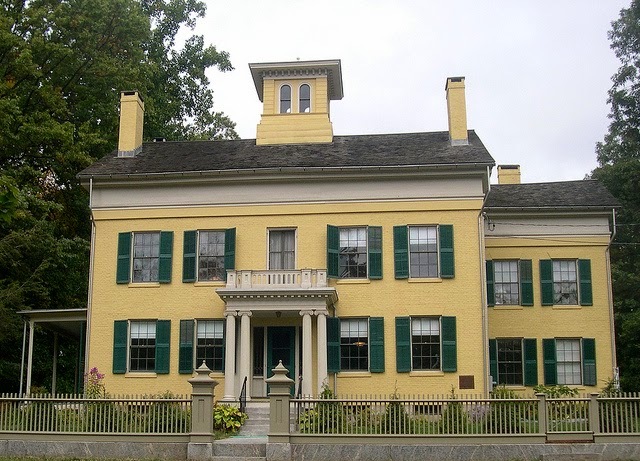 She has received fellowships from the Bread Loaf Writers’ Conference and the Sewanee Writers’ Conference. 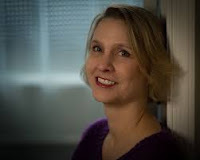 Pietrzyk is a member of the core fiction faculty at the Converse low-residency MFA program and teaches in the MA Program in Writing at Johns Hopkins University. She lives in Alexandria, Virginia. 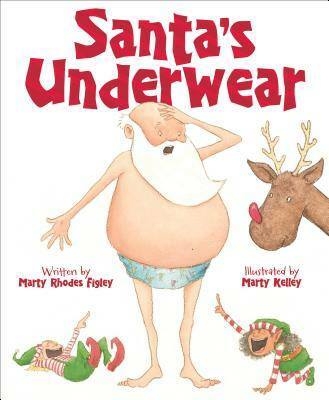 Note from Marty: The above review was a starred review. Leslie also received $15,000 with her Drue Heinz Literature Prize. Congratulations, Leslie! WHAT THE HECK IS LEGAL WRITING? AN INTERVIEW WITH MY FAVORITE "EDITOR"
I’ve been writing for children for over twenty-five years. The person who vets my manuscript before it leaves the house has always been my husband, Paul. He catches all of my initial errors in spelling, sentence structure, grammar, and consistency. Sometimes our “editing conversations” get heated when he messes with my story structure. Poor guy. I might burst out with, “What do you mean?” “How dare you!” These are words I would never use with a publishing house editor and Paul's advice is usually sound. But Paul keeps coming back for more drama when I ask him to, “Please take a look at this.” I am eternally grateful for his wonderful skills, support . . . and patience. Here I am with my favorite "editor." After working over thirty years as an attorney with the Justice Department he now teaches Torts and Legal Writing at American University’s Washington School of Law. 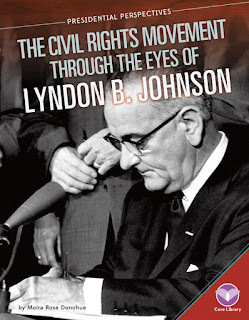 Since he has transitioned into teaching, Paul has published numerous articles and this book. With the recent passing of William Zinsser, author of the classic ON WRITING WELL excellence in all kinds of writing has been on my mind. I’ve been living with Paul for forty years but know little about legal writing. Today I decided quiz my favorite editor on this topic. Can you explain what legal writing is? Legal writing is writing done for law-trained readers in a form they expect and that meets their needs. 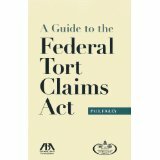 It uses structured legal analysis to explain how the law applies in a particular situation. Structured legal analysis boils down to stating the issue to be addressed, stating the rule that applies to that issue, applying the rule to the facts at hand, and reaching a conclusion. Lawyers call this IRAC (Issue, Rule, Application, Conclusion). We use structured legal analysis for both objective and persuasive writing. Objective writing is explaining in a neutral fashion how the law applies in a given situation. Here is an example. The issue is whether your sister gave you book when she said, “I want you to have this forever,” as she handed you the book and you put it in your bag. The Rule for a valid gift requires (1) intent to give, (2) delivery, and (3) acceptance. Applying the Rule here is easy. (1) Your sister saying, “I want you to have this forever,” shows intent. (2) When she handed you the book she made delivery. (3) When you put it in your bag, you accepted it. In conclusion, because each requirement of the Rule was met there was a valid gift. Objective writing applies the Rule to the facts to find the Conclusion. Persuasive writing is advocacy. Here the writer is trying to lead the reader to one conclusion rather than another. This is an example. The issue is whether your sister gave you book when she said, “I want you to have this forever,” as she put it on your mom’s kitchen table from which you picked it up and put it in your bag after she left. The Rule for a valid gift requires (1) intent to give, (2) delivery, and (3) acceptance. Applying the Rule here is easy [or so the Advocate says]. Two requirements are met: (1) your sister saying, “I want you to have this forever,” shows intent; (3) your picking up the book and bagging it shows acceptance. 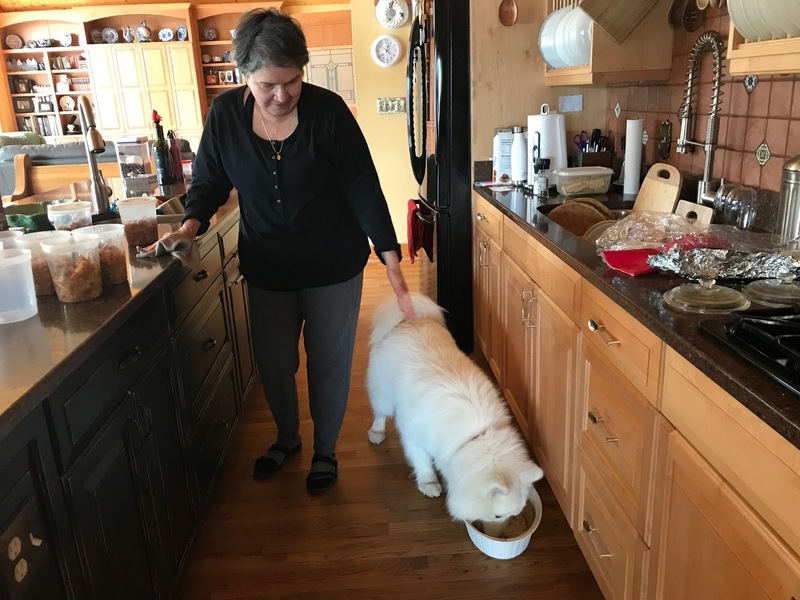 But the requirement (2) delivery was not met because Mom’s table is a neutral place where family members have put things for years without any thought that doing so changed the ownership of the objects. In conclusion, because the delivery requirement of the Rule was not met there was a not valid gift. In this example the Advocate’s argument turns on how one requirement of the Rule applies to the facts. An Advocate might also argue that the Issue really involves different facts or that a different Rule should be applied. Persuasive writing begins with the Conclusion and works backward to make the facts and the Rule fit. We know the Conclusion from the outset because whenever lawyers engage in persuasive writing they always conclude that their side wins. What makes good legal writing? Good legal writing, like all good writing, can be judged objectively by whether it succeeds in accomplishing its intended purpose with the audience for whom it is written. My students learn that Audience & Purpose form the foundation for all successful communications. If the purpose of a document is to advise a client about the likely consequences of a proposed action, the document will be successful if it accurately explains the matter in terms the client can trust and understand. If a legal brief is written to persuade a judge to rule in a particular way, it will be successful if it explains the matter in a way that leads the judge to trust the writer, follow the logic of the argument, empathize with the advocate’s client, and agree with the author’s conclusion. In both examples, details matter, clarity is critical, and sloppiness that the reader perceives will undermine the document’s credibility. There are many successful authors of fiction who started out as lawyers, including two women in my writing group. Are there skills learned in legal writing that transition into creative writing? This is a really hard question. Successful legal writers may be more aware of the importance of Audience and Purpose than other people. They certainly understand the importance of accuracy and clarity. I don’t think these provide a critical advantage to writing fiction. I think the single biggest advantage lawyers have in writing fiction is that many lawyers spend a substantial portion of their time writing and re-writing. We write every day. We learn to organize our thoughts, put them in a form that can be readily understood, and edit what we have written. The constant practice may make it easier when we turn to another form of writing.